SEE ME FEEL ME TOUCH ME bloomed in our garden from a seed that I purchased from Fran Harding. I introduced SEE ME FEEL ME TOUCH ME in 2006 and have talked many times about it. The cross is ((Forestlake Own Agenda × Forestlake Ragamuffin) × (Ida’s Magic × Admiral’s Braid)) Dor., 27″, MLa., 5.75″, 4 way branching, 25 budcount I’ve always known that SEE ME was a good daylily but it is nice when others recognize it. SEE ME FEEL ME TOUCH ME rose to stardom while on display at Karol Emmerich’s during the Nationals. Karol was very proud of it on display in front of her greenhouse. 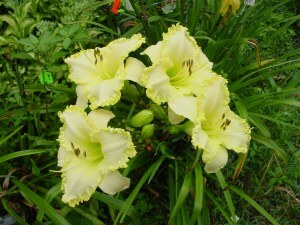 And Margo Reed complimented the daylily in saying it was the finest daylily she saw during the Minneapolis convention. SEE ME displayed beautifully in a clump. 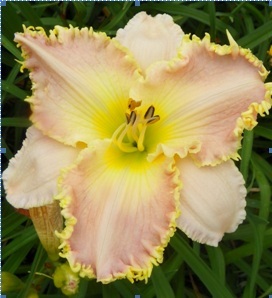 The daylily has been a good breeder daylily for other hybridizers including Jamie Gossard, Dave Mussar and Claudia Conway. The kids out of it tend to be clear in color. 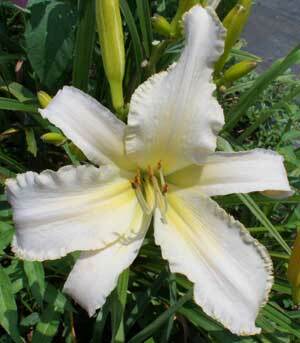 The daylily hasn’t to my knowledge produced teeth edges the first generation if crossed to non teeth daylilies. But it does give a light edge. So far we’ve introduced six daylilies with SEE ME FEEL ME TOUCH ME in the background. 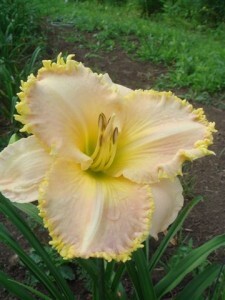 Jamie has introduced one daylily. The daylily shows a stronger teeth edge the hotter it is so I’d suspect the edge is heat related to a degree. SEE ME FEEL ME TOUCH ME breeds narrow fairly easy. 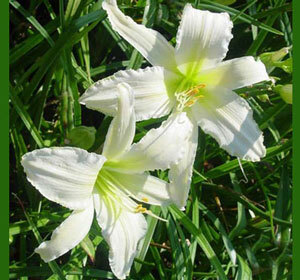 The daylily can and still should be used for dormancy, clear colors, and good plant habit. For a good all around teeth daylily, SEE ME FEEL ME TOUCH ME qualifies for a top nine teeth daylily 2003-2008. © 2011, Mike. All rights reserved. Copyright extended to images. 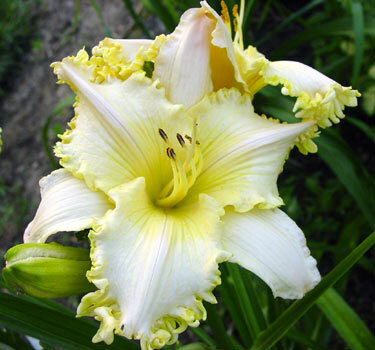 This entry was posted in Daylily Hybridizing, Introductions and tagged Dave Mussar, daylily, Jamie Gossard, Lighter Side Of Life, mike holmes, SEE ME FEEL ME TOUCH ME, Stardust Dragon, teeth. Bookmark the permalink.